Description - Our 3.2mm pre-cut rubber underlayment is a millimeter thicker than our 2mm roll, but offers a greater amount of sound reduction comparatively. Rubber underlayments are very popular with hard surfaces, due to the fact that rubber is more rigid, and provide the firmness necessary to resist compression from heavy objects and foot traffic. Our underlayment is also mold and mildew resistant due to the addition of a antimicrobial additive which inhibits the growth of both. Our flooring underlayment also doesn’t hold water, which allows for installation of the underlayment without a vapor barrier. But if the flooring will be installed in an area where water may be present, then a vapor barrier would be required. Also a vapor barrier may be needed per the manufacturer’s warranty. This sound proofing underlayment is also very popular with our Grid-Loc and Modular tiles due to the fact that it is very thin and helps to reduce the noise that can be made from them. So if you are looking for an underlayment that is affordable but at the same time gives you good sound absorption, then this is the product for you. Material - Our 3.2mm pre-cut rubber underlayment is comprised of more than 85% recycled material. Length - Our rubber underlayment comes in 25’. Thickness - 3.2mm (Approx. 1/8”). Recommended Uses - Our 3.2mm flooring underlayment is designed to be used in both commercial and residential applications. 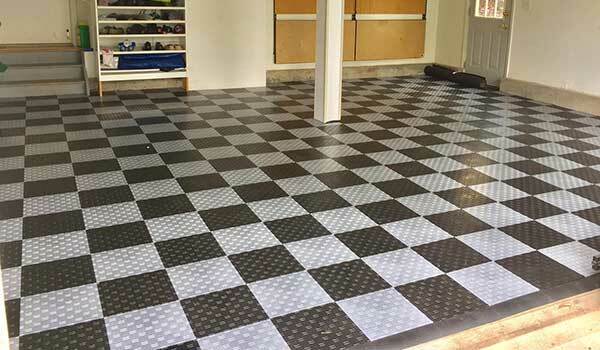 Rubber underlayment is the favorite to use under hard surfaces such as natural stone and hard woods, but it has also been successfully used under ceramic tile, laminate, engineered wood, real wood, marble, brick, pavers, parquet, carpet and tiles. It is NOT recommended for VCT (Vinyl Composition Tile), vinyl, and linoleum. Can be used with our Grid-Loc tiles, hardwoods, natural wood, laminate, engineered wood, real wood, and tiles. Do not use with vinyl, VCT, or linoleum. Can be adhered with nails, polyurethane adhesive, staples, or double sided tape. Antimicrobial added to prevent the formation of mold and mildew. I want to use this rubber underlayment under a heated tile floor. won't this give when you walk on it and break the grout? shouldn't you glue this down so it doesn't move when installing tile? sounds like you can't mud over the rubber and then install the tiles on top, so what goes over the top of the underlayment to mud the heat cables on then the tile? what thickness should you use? Rubber underlayment can be used underneath floor heating and we would recommend gluing it down in your scenario. The heating element can be installed directly to the rubber underlay, please check with the floor heating product guidelines for that product. 3.2mm thickness is suitable for this application, you may choose another thickness only if you need to add further height to the floor. I made two slide out drawers in the back of my pickup truck and I used this material as an underlayment under the frame of the drawers to keep it from sliding around in the truck. I also used it in the drawers and on the top so my tools don't slide around. I did a lot of research before purchasing this underlayment. I was searching for an underlayment that would add a little cushion to a very large Interface carpet tile area rug. I purchased the 3.2 mm underlayment and it worked great. Its easy to work with and I connected the rolls with Gorilla tape as its stronger then duct tape. It made the carpet feel much more luxurious and helps with sound insulation. If I did it again I would use the 5.0 mm for even more cushion. Quality product, great price, easy to cut with a box cutter and the customer service was great. Thanks! I am very happy with the purchased of tiles as well as underlayment. I was pleasantly surprised by the low amount of noise being transmitted by the flooring. I put the underlayment first and then installed the floating tiles for my garage. Impressed with the shine and the performance (sound insulation). Whole process took about 8-10 hours (underlayment+Flooring) including the time for cutting the tiles. I did this for the first time and my skill level is minimal. overall I was happy that I was able to do this in 10 hrs. It was a satisfying purchase with not much wastage in material. I went with the material amount suggested by you and was left with about 20 sqft of flooring left which I might need just in case of any repair work. Friendly staff on time delivery made the experience better. I am attaching a few pics of my garage installation. I USED IT TO UNDERLAY ENGINEERED MAPLE FLOORING AND IT WAS VERY EASY TO INSTALL. IT'S HEAVIER THAN EXPECTED BUT IN THE LONG RUN THAT IS GOOD.